By TruePublica Editor: Liam Fox came right out and said it himself – the entire language of Brexit was about lies, disinformation and propaganda. 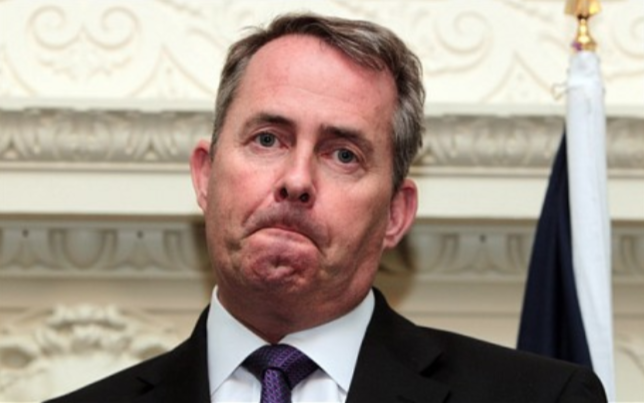 Back in October 2016 Liam Fox, a leading Brexit campaigner ahead of the June 23 referendum, said Britain did not need to re-apply to join the WTO, the international trade body, when it leaves the European Union as it was already “a full and founding member”. Before the referendum, WTO Director-General Roberto Azevedo warned – “renegotiating Britain’s relationship with the rest of the WTO could take years or even decades” – and let’s be fair, he should know. Fast forward to yesterday. Widely reported was that Liam Fox has said leaving the European Union without a deal will be “survivable.” Did the Brexit voting population of Britain decide that a ‘survivable’ Britain would be Brexit’s first outcome? Fox then decided to dig his hole even deeper. Something between optimism and pessimism would probably mean the current status quo. Brexiteers didn’t vote for that either, they voted for a rising sun on a new empire. Then Fox went on to caution against relying on World Trade Organisation terms, which is what Britain will revert to trading on if no deal is reached – even though that is eactly what Fox was relying on for the last two and half years. Fox’s sudden about turn on the WTO comes about because … well, he failed to secure a deal on WTO terms in anticipation of a no-deal scenario. Not so well reported by the mouthpiece of right-wing Conservatism such as the Daily Mail, Express, Sun and other unreliable gutter press outlets is the plain truth. And it is this – last October, International Trade Secretary Liam Fox was forced into an embarrassing admission – his plan to quickly normalize the U.K.’s World Trade Organization commitments had failed, forcing the government to enter into what will likely be lengthy negotiations with other members on basic terms of trade after Brexit. It is not as if he and the government were not warned. And what does this mean? It means, in a matter of weeks we leave the EU trading bloc by law – with no trading agreements, not even with the WTO. This piece of news, so under-reported as it is, is, to say the least, significant. Fox and therefore the British government was proposing to replicate the European Union’s current WTO trade terms after it leaves the 27 nation trading bloc. Without certified WTO commitments on market access and tariffs, it’s still possible for the U.K. to trade but will make it even more difficult to strike new trade deals, which are a key rallying cry among Brexit supporters. What happened was that a number of WTO members, which included the U.S., New Zealand and more than a dozen major exporters said they opposed the U.K.’s approach and terms and then formally objected to the British government application, the consequence was that Britain’s proposal to join on WTO terms were rejected … by some of the very countries that Liam Fox is claiming Britain will be able to trade with. “The terms we have set out will form the basis of our trade policy while we engage with our WTO partners to address their concerns” – so said an unnamed British government trade official. The opposing countries said that if they agreed to Britain’s WTO terms, it would harm their ability to sell goods to Europe. Fox then said the U.K. will now pursue a modification of its WTO commitments under Article 28 of the General Agreement on Tariffs and Trade. It should be noted that this is usually a laborious and lengthy process that could delay for years the U.K.’s ability to have a certified set of WTO commitments. As warned. And if Liam Fox tries to tell anyone that the UK is already a member of the WTO – what he is not saying is that its schedule of concessions, which reflect tariff commitments and terms relating to trade in goods and services – are established in the European Communities’ schedule – of which, Britain is currently a member of, but won’t be come March 29th. He was catastrophically wrong on both counts. No trade deal has been done and it was previously known technicalities that got in the way of economics. Even Peter Mandelson, sacked from high office as many times as Fox has been could see that WTO rules would not instantly work for Britain. Trading under WTO rules, would, he argued “wipe out agreements and take away preferential access”. And how right he was on both counts. In the meantime, Fox now appears to back a scenario where Article 50 had to be extended, saying it could be needed to ensure legislation goes through in time, even though he publicly warned Theresa May that extending Brexit negotiations would be a “complete betrayal” of the British public just six months ago. All this from a man who had the temerity to say – “It’s very clear that Jeremy Corbyn and his fellow left-wingers were undermining the case for our security” – when it was Fox who was forced to resign sacked by the government for undermining national security. It was a serious breach of security and a serious abuse of governmental power. Liam Fox shouldn’t have just departed the front bench; he should have been forced out as an MP in disgrace. Even in much more corrupt countries than ours, such a dereliction of duty on national defence matters is taken very seriously. Why Fox is anywhere near a democracy is a mystery.